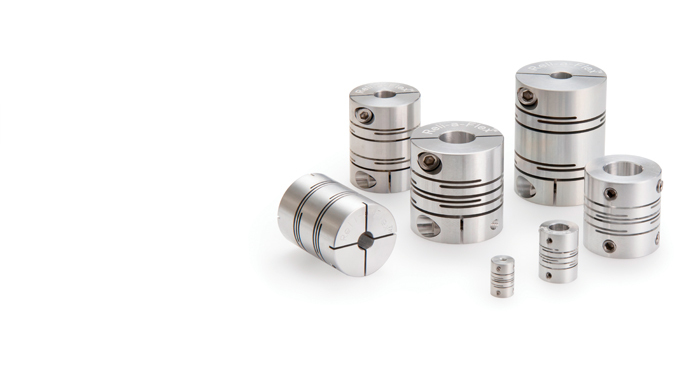 Reli-a-Flex® one piece precision flexible shaft couplings from Reliance Precision are designed to cope with angular and parallel misalignment while maintaining highly accurate motion transfer between two rotating shafts. The patented design slot feature allows Reli-a-Flex® couplings to maintain the centre piece angle and constant pivot length, even under significant misalignment conditions. Alternative one piece couplings often resemble the Reli-a-Flex® but may have a slot pattern where the pivot points are able to move in and out, causing the centre piece angle to deviate. Reli-a-Flex® couplings however, have been tested at 80% maximum offset for 50,000,000 cycles; producing bi-directional error up to six times less than that of other four beam spiral couplings. Uniform stress levels, combined with accurate angular rotation and a constant pivot length, makes the Reli-a-Flex® one piece flexible shaft coupling the ideal choice for design engineers working in the printing, medical and scientific instrument sectors where it is necessary to maintain predictable and accurate transfer of motion. Available as a standard catalogue product with outside diameters ranging from 6mm to 40mm and manufactured from aircraft grade aluminium alloy, Reli-a-Flex® flexible shaft couplings can also be selected by visiting the online store where a custom coupling can be created to match specific design applications. Contact Reliance at sales@reliance.co.uk for more product information, design support and custom solutions.